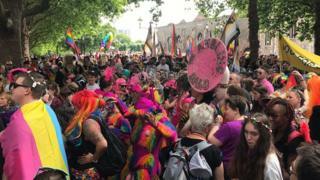 Thousands of people have taken part in Bristol's Pride parade, making it "one of the largest" in the UK. Organiser Daryn Carter said up to 30,000 people had descended on the city to take part in the parade and free festival events. This year's "Global Voice" themed event marks the end of Pride Week, a celebration of the LGBT community. About 26,000 have also taken part in London Pride, which was watched by a crowd of about one million. Image caption Organisers say the event has been "growing and growing" and is now "one of the largest free Prides in the UK"
Bristol's annual march, which is in its seventh year, set off from Castle Park at 11:00 BST, with people packing the streets as they walked the 2 mile (3km) route to Millennium Square. It also marked 50 years since homosexuality was decriminalised in England and Wales. Mr Carter said it was "amazing" to see so many people at the event. "We've got the older generation here who remember having to live under that law and the younger generation who may know [about it], but it's really great for us all to come together and celebrate our diversity," he said. "I think we really are up there in the top - we were voted number two best Pride just a couple of years ago and we've been growing and growing ever since. "We've had about 30,000 people come today which makes us one of the largest free Pride [events] in the UK, so we're really putting Bristol on the map."